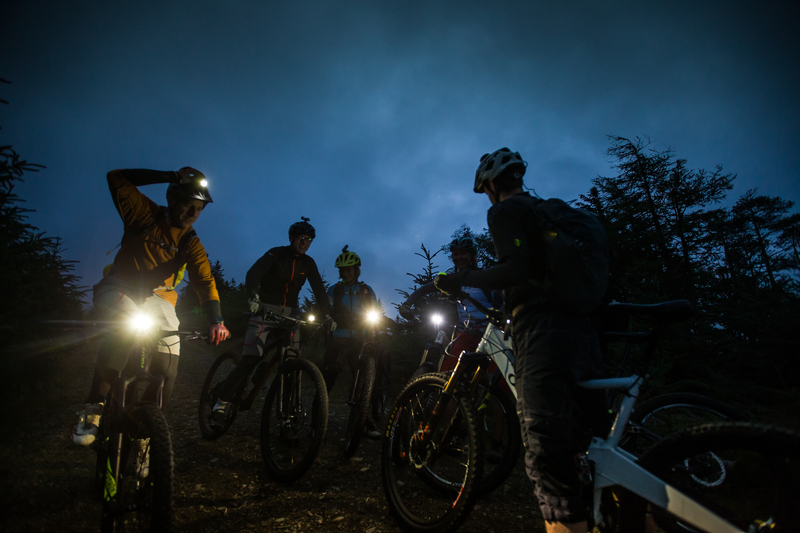 The Night Leader Award is aimed at qualified mountain bike leaders with substantial night riding experience looking to lead groups and individuals confidently and competently after sundown. Leaders retain their ability to lead in the same conditions as their primary mountain bike leadership award, extending their capacity to lead beyond the hours of daylight. Qualified leaders with this award are already proficient Leaders with substantial experience of riding in dark conditions. The training and assessment courses build on the skills, knowledge and experience that previous qualifications and leading has provided. The pathway through the Night Leader Award comprises pre-requisites including holding an existing mountain bike leadership qualification, and single day’s training and a single day’s assessment spilt by a consolidation period of building experience and putting key Night Leader tools into practice. Be registered on the British Cycling Mountain Bike Leadership Award Scheme. Holders of the Level 2 or 3 qualifications will already have completed this. Holders of TCL or MBL Awards will need to register, where they haven’t previously. The training course comprises one day’s duration, starting from lunchtime and running into the evening, although specific timings may vary according to the time of year. Expect at least 3 hours on the trail during darkness. Utilising your existing mountain bike leadership experience and knowledge, this course focuses particularly on safe and effective leadership skills used during dark conditions including those of communication, motivation, organisation and decision making coupled with detailed route planning and navigation. It expands on the development and implementation of robust Emergency Action and Late Back Procedures. The course also covers additional risk factors when leading in the dark and at night, environmental and social responsibilities, impacts on riders of being active at night, lighting with battery theory and additional equipment, reflective clothing and highway factors comprising legal lighting requirements and managing groups on the road in the dark. Note that this course is not an introduction to night riding and expects an existing level of personal confidence and competence at riding at night. The Night Leader assessment consists of a theory assessment completed in advance and a practical assessment. The theory assessment comprises an open book home study task including short answer questions. The practical assessment comprises tasks and applied leading of peers to evidence your competencies and experience. It is one day’s duration starting from early afternoon through to the evening and full darkness. Expect at least 3 hours on the trail in dark conditions. Precise course timings may vary according to the time of year. You will be expected to have pre-ridden the (provided) assessment route in advance of the practical assessment. *Direct entry to the assessment may be permitted where the Leader can evidence extensive and substantial prior experience of leading and of leading in the dark and prior training such as MBLA Night Leading Module. Final approval is made through a discussion with the assessor prior to application. © 2017 MTB Leadership. All rights reserved. Website designed by First Design Print Web.